If you look at the profile of senior leadership in publicly listed companies, the picture is predominantly of men in their 50s and 60s, a generation defined as baby boomers. The Norman Broadbent 2014 Board Review of 1,700 quoted companies found that chairman and non-executive directors tend to be in their 60s. However, in ten to fifteen years’ time, many of the top positions will be occupied by millennials, those born between the early-80s to early-2000s. In fact, in some tech and startup businesses, millennials such as Facebook’s Mark Zuckerberg already occupy leadership positions. The dominance of the old-school chief executive is on the wane, predicts Jonathan Hime, group managing partner at leadership advisory firm Marlin Hawk. “Boardrooms will look very different in five years’ time as the millennials rise through the ranks and challenge the management culture in many organisations,” he says. Why does the march of the millennials matter? Deloitte estimate millennials will comprise 75 per cent of the global workforce by 2025, so it’s critical firms get to grips with the talent management of this generational cohort. In the UK, millennials currently form 35 per cent of the UK workforce and this figure can only increase. Organisations ignore the development of millennials in their workplace at their peril, warns Dimple Agarwal, a partner at Deloitte. “In most global companies, 40 to 50 per cent of their workforce are millennials. If you’re not taking care of a big chunk of your workforce now, then you’re already behind your competitors,” she says. 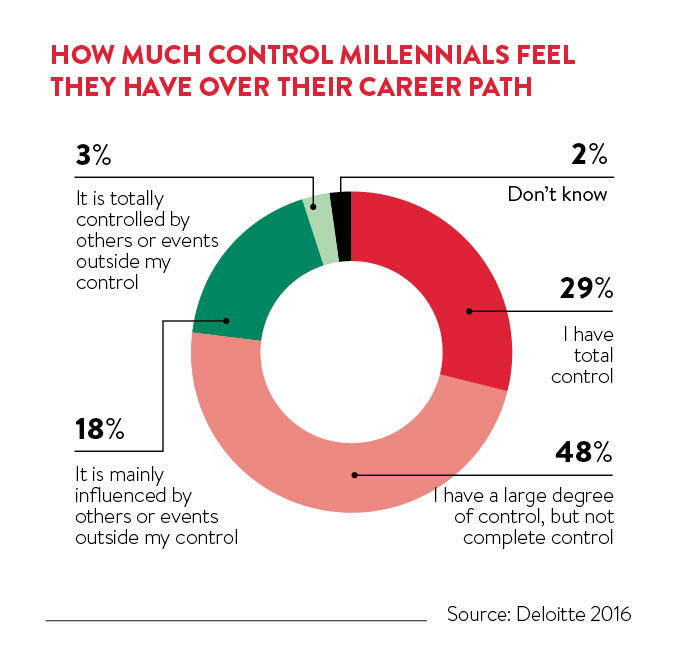 The 2016 Deloitte Millennial Survey of 7,700 millennials in full-time employment and drawn from 29 countries found that nearly two-thirds of millennials say their leadership skills are not being fully developed. This was despite the fact that millennials believed business placed the highest value on leadership as a skill in a 2015 Deloitte survey. “There is a big gap in expectations with millennials believing that organisations are not investing enough in them,” says Ms Agarwal. 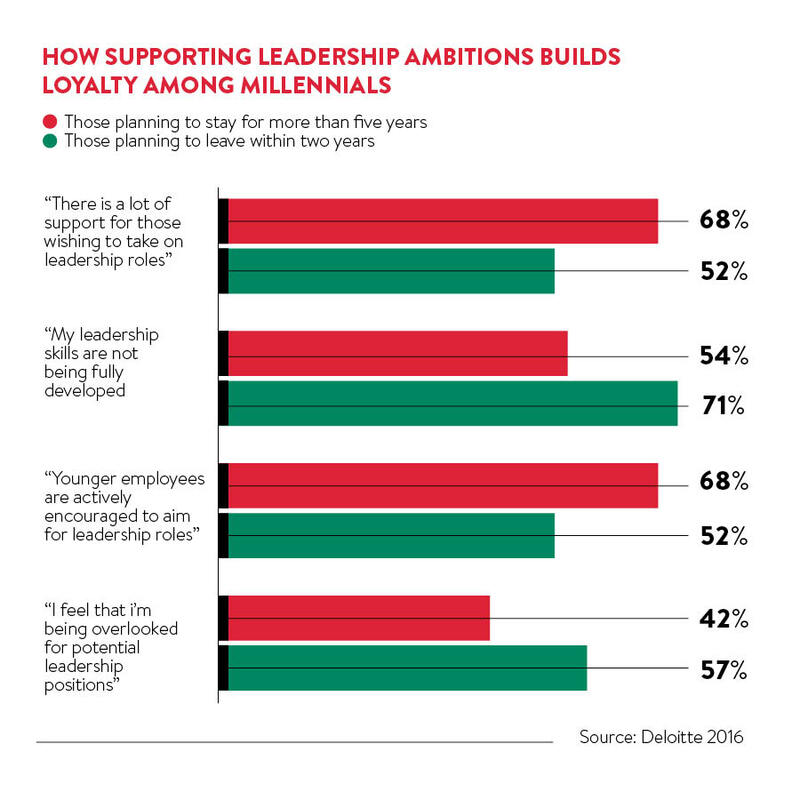 The 2016 Deloitte survey also reveals that the millennial generation aren’t particularly loyal to their employer as two in three millennials expect to leave their organisation by 2020. This presents a big talent management challenge for organisations striving to retain a large segment of their workforce. Millennials change jobs more frequently than previous generations, says Sue Honoré, associate research consultant at Ashridge Executive Education. “Therefore, they are constantly seeking interesting and challenging work, and have less patience for drudgery. They value coaching and mentoring highly, and expect those more experienced people around them to provide that freely,” says Dr Honoré. This generation is nomadic, and open to working and living abroad, says Mr Hime. “They want exposure to new cultures and geographies. This will be a leader who wants to be truly cross-cultural and embed themselves into a different environment, so their style is much more global,” he says. Another factor that distinguishes millennials from other generations is their preference for technology, says Ksenia Zheltoukhova, research adviser for the Chartered Institute of Personnel and Development. “They want to access information quickly and want more real-time feedback, so organisations need to develop learning on the job rather than going on a course,” she says. Leadership development needs to change not just due to the expectations of the millennial generation, but as a result of the volatile economic conditions in which businesses operate, says Dr Bernd Vogel, associate professor of leadership and organisational behaviour at Henley Business School. 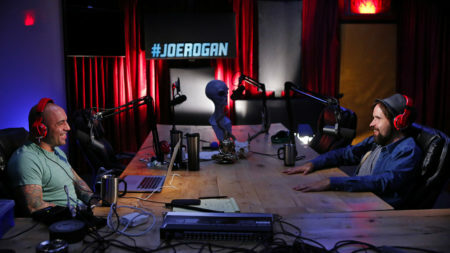 “It’s about more stretch assignments and on-the-job learning especially if you have a business environment that is ambiguous and volatile,” he says. Ms Zheltoukhova believes that millennial leaders will be interested in a wide range of outcomes from leadership, not purely financial. “Millennials are much more inclusive in their approach and they’re not just thinking about the bottom-line outcomes, but the social outcomes as well,” she says. This preference for ethical leadership is reflected in the 2016 Deloitte Millennial Survey which found that 87 per cent of millennials believe that the success of a business should be measured in terms of more than just its financial performance. 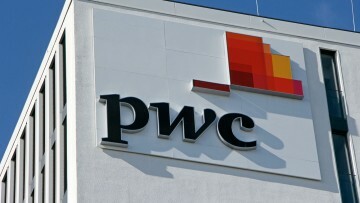 PwC, the largest professional services firm in the world and one of the big four auditors, employs some 20,000 people in the UK of whom 66 per cent are millennials. As a result, PwC has developed an online game, to be launched in April, for its employees to be able to experiment with their leadership style and approach within a simulated environment. “We’ve developed project management simulation to allow our learners to be project management leaders and the simulation provides feedback relevant to the learner,” says Ms Brownhill. PwC is investing in leadership capability at an early point in the millennial’s career as this reflects the complexity and pace of change that people will have to deal with at all levels of the organisation. This year, the firm developed an 18-month leadership programme for its newly promoted staff to provide them with a strong foundation in leadership skills and help millennials pro-actively plan their careers. “Part of the emphasis is on our people building broader networks and also focusing on developing their own resilience, which is increasingly an issue because of the complex world we live in,” Ms Brownhill concludes.